Fresh off a season in which they deployed the worst rotation in the Majors, the Twins have aggressively targeted arms to improve their starting five. The first step in that plan was made official today, as the Twins have announced the signing of Ricky Nolasco to a four-year, $49MM contract. Nolasco will be paid $12MM annually from 2014-17, and the Twins have a club option that could vest for a fifth year. Nolasco reportedly obtains a small, three-team no-trade clause. His option, valued at $13MM, will reportedly vest if he totals 400 innings from 2016-17. If not, the Twins can instead elect to pay a $1MM buyout. 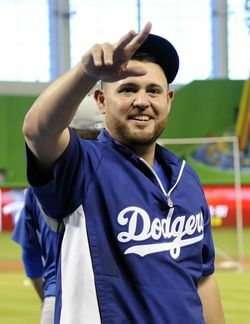 Nolasco split the 2013 season between the Marlins and Dodgers, totaling a 3.70 ERA with 7.4 K/9, 2.1 BB/9 and a 43 percent ground-ball rate. The soon-to-be 31-year-old was one of the earliest players to be moved this July, as the Dodgers sent a trio of minor leaguers (Josh Wall, Steve Ames and Angel Sanchez) and paid the roughly $6MM remaining in Nolasco's salary. Nolasco figures to provide a serious jolt in the arm to a Twins' pitching staff that was sorely lacking reliable arms in the rotation. Twins starters ranked last in baseball in terms of ERA (5.26) and K/9 (4.9) — both marks which Nolasco should aid considerably. The longtime Marlin and brief Dodger figures to join a rotation that will also include Kevin Correia and perhaps Samuel Deduno, but beyond that there are no true locks in the rotation. Top prospect Kyle Gibson struggled in his debut season but figures to receive another chance in 2014, and Alex Meyer, who ranks as MLB.com's No. 31 overall prospect, could have a chance as well. However, the Twins have voiced a desire to add a pair of veteran arms to their rotation this offseason, so I'd expect them to continue being active at next week's Winter Meetings. While terms of the deal haven't surfaced at this time, Nolasco figures to shatter Josh Willingham's three-year, $21MM contract — the Twins' previous record contract for a free agent. MLBTR's Tim Dierkes' most recent projection for Nolasco's contract was in the range of Edwin Jackson's four-year, $52MM deal. MLBTR's Tim Dierkes first reported that the Twins were on the verge of a significant free agent signing. Chris Cotillo of MLB Daily Dish reported the agreement (Twitter link), while Jeff Passan of Yahoo Sports reported the terms of the deal (Twitter links). Mike Berardino of the St. Paul Pioneer Press reported Nolasco's limited no-trade clause and details on his option (Twitter links).